P.I. Castings Ltd - one of the longest established manufacturers of investment castings in Europe and one of only a few with the capability to produce high integrity castings in both aluminium and steels from one location. Investment castings are produced for all types of industries including aerospace, defence, medical, electronics, transport, mechanical equipment and general engineering and can be supplied fully machined, treated and ready for assembly. In our business there is no substitute for experience. We have been making precision investment castings by the lost wax process for over 55 years and have a wealth of knowledge, which is invaluable when giving our customers technical advice from the early design stages through to full production. This is backed up by some of the most comprehensive in-house facilities of any investment casting company, including heat-treatment, x-ray, spectrographic analysis, mechanical testing and co-ordinate measuring machines. We also have our own Rapid Prototyping machine for producing rapid prototype investment castings without the need for tooling. Our customer-orientated team has the experience and flexibility to meet the most stringent technical, quality and delivery requirements enabling P.I. Castings to achieve preferred supplier status with many major aerospace, defence and engineering companies. Investment castings can offer many advantages in the production of metal components, especially where complex shapes are required. With investment castings, most rough machining operations can be eliminated; there is a greater freedom of design; lighter and cleaner looking components can be made; assembled items may be replaced with ‘one-piece’ investment castings - all these advantages embodied in the widest range of materials. Generally ±0.125mm per 25mm (±0.005" per inch) depending on component configuration. No casting joint lines, no draft taper. Aluminium dies are used to produce wax patterns. 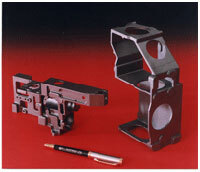 Tooling costs are relatively low; modifications are usually easy and tool life is excellent. Investment castings can be made from less than 5mm long to more than 600mm. Depending on size and complexity, batch quantities as low as 25 can be economical. More typical quantities are hundreds or thousands and we have the capability of producing thousands of investment castings per week. Approved to produce investment castings to ISO 9001:2000 including Aerospace sector AS9100 and AECMA EASE, NADCAP approval for NDT. Also approved independently by many UK and international organisations. Fully finished investment castings can be supplied includes machining, alochroming, fitting threaded inserts, painting, polishing or sub-assembly . P. I. Castings Ltd is a leader in the production of investment cast metal Rapid Prototypes having been involved for 20 years since the first stereolithography machine arrived in Europe. Only a couple of independent investment casting companies in the UK have their own Rapid Prototyping equipment and we are one! P. I. Castings can take your CAD designs and turn them directly into a pattern, which can be used to produce investment castings in our usual range of metals including aluminium, steel, stainless, brass, bronze, zinc, etc. Apart from using our own 3D Printer, we have made thousands of investment castings with all the other Rapid Prototyping techniques, including Stereolithography, Quickcast, Selective Laser Sintering (SLS) and rubber mould methods. There is no single technique which is suitable for all investment casting applications and we will advise you on the most suitable to produce your component. Design for Rapid Prototyping - The required component must be designed as a 3-D solid or surface representation. All of the required design features such as corner radii and machining allowances must be included in the CAD design, as they will be faithfully reproduced on the model used to produce the investment casting. It is essential to discuss technical and design details with our engineers at an early stage to ensure that the component features are suitable for the casting process. Size, Tolerance and Surface Finish - P. I. 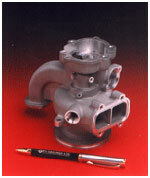 Castings have made Rapid Prototypes with dimensions up to 660mm. Dimensional tolerances depend on the configuration of the part and would be wider than normal investment casting tolerances produced from conventional tooling. Depending on the process used, the models may not have as fine a surface as a normal investment casting, but it is possible to smooth the models to give a generally acceptable surface finish. Material - Parts can be cast in the same wide range of materials used for production investment castings, including Low Alloy steels, Stainless steels, Nickel and Cobalt based alloys, Carbon Steels, Magnetic irons, Aluminium, Zinc, Brass and Bronze. Cost - The cost of making rapid prototype models will depend on size, configuration, quantity and the technique used. The height of the rapid prototype model particularly affects the build-up time and cost. In the investment casting operations, the largest influence on price is the quantity required as well as casting complexity and the material. Data Required - For producing rapid prototype models, an STL file of the solid 3D CAD data is required. If you do not have an STL facility, then please send an IGES solid model file and we will convert it. Turbotech Precision Products Ltd – Specialists in the manufacture of aluminium compressor wheels for automotive diesel turbochargers. Turbotech manufacture compressor wheels, mainly for trucks and heavy vehicles for customers world-wide.